Niekro was the last MLB pitcher to have both won and lost 20 or more games in the same season; with the 1979 Braves, Niekro finished with 21 wins and 20 losses. His third and final 20-win season came in 1979; it was also the second and final year that he lost 20 games. Niekro was born in Blaine, Ohio, attended Bridgeport High School in Bridgeport, Ohio, and was a boyhood friend of Basketball Hall-of-Famer John Havlicek. The baseball field on which he played at Bridgeport High School's Perkins Field athletic complex was renamed "The Niekro Diamond" in 2008 after both Phil and his brother, Joe. Niekro was the son of a coal miner; his father had pitched semipro baseball and had learned to throw a knuckleball from another coal miner. Phil and his younger brother, fellow major league pitcher Joe Niekro, learned the pitch from their father in their backyard as kids. Phil and his family have continued to support the students of Bridgeport High School with the proceeds from the annual golf tournament "The Niekro Classic". 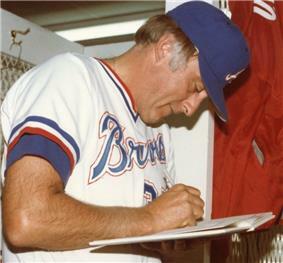 ^ a b c d e f g Phil Niekro Statistics and History. Baseball-Reference.com. Retrieved January 17, 2015. ^ "Phil Niekro Goes Home to Visit His Ailing Father". ^ Smith, Claire (January 8, 1997). "Coal Miner's Gift Is Treasured by Son". 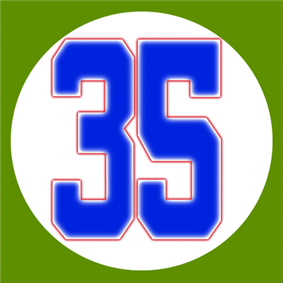 ^ a b c "Phil League Minor League Statistics and History". ^ a b Down, Fred (February 27, 1968). 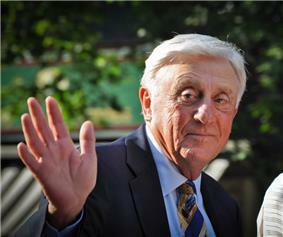 "Harris planning dual role for Phil Niekro". ^ Quinn, T.J. (September 2003). "Road to 300: with Roger Clemens becoming the 21st pitcher to win 300 big league games, here are the stories of seven others who reached the same milestone". ^ Clark, Dave (2012). The Knucklebook: Everything You Need to Know About Baseball's Strangest Pitch—the Knuckleball. Ivan R. Dee. p. 74. ^ a b "Phil Niekro enters Hall alone".